An explosion starts pressure waves in the medium where it happens. Explosions are categorized as deflagrations if the pressure waves are subsonic and detonations if they are supersonic. When a detonation happens, the supersonic pressure waves are named shock waves. Unintentional explosions can be caused when chemicals are mixed together, or when pressurized containers or flammable materials are heated or exposed to flames. To cause an explosion, pressure does not have to be present but is always a result of an explosion. Several safety measures are used to prevent unintentional explosions. Many countries require that chemicals, fuels, and pressurized containers that may explode be labelled with warning labels. As well, many countries have regulations restricting the possession and use of potentially explosive materials so they will only go to appropriate industrial and research uses. Transportation regulations require potentially explosive chemicals, fuels, and pressurized containers to be transported safely. Intentional explosions are caused when armies fire artillery or when military air forces drop bombs during a war. Intentional explosions are also used by civilians in activities such as mining, construction, and large-scale civil engineering projects such as building tunnels, roads, railways, and dams. Military engineers handle explosives and arrange intentional explosions during the wartime. 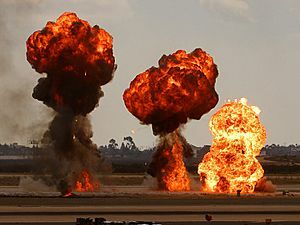 Making up an intentional explosion is called demolition. They are used to break up old and obsolete buildings and bridges, and to break rock and stone for construction. Explosion Facts for Kids. Kiddle Encyclopedia.